Another Wonder Festival has come and gone. 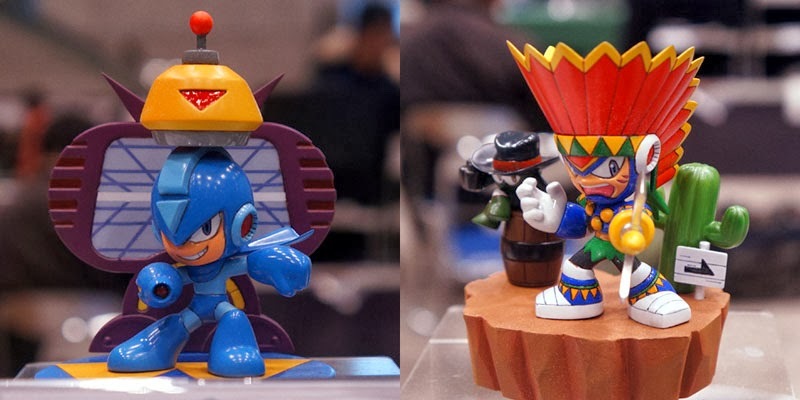 The Mega Man offerings were a little sparse this time around compared to previous seasons, unfortunately. What was on display, however, did not disappoint. Planeswalker's Powered Up inspired figures were definitely one of the big draws at the show. Just look at 'em; a perfect blend of cute and cool! Truly, this is the type of merchandise I'd like to see (because really, I think we've just about had enough of random Powered Up paraphernalia). Want some more? Hit the jump for Tomahawk Man and Copy Mega Man! *head exploded* .__. NEEEED ! It's a useless cartoon statue, guys. Get a grip. How 'bout you let people gush over the incredible craftsmanship that went into these "useless cartoon statues" in peace? Don't tell people what to do with their own money. How about ignoring that guy and do whatever you want with your money instead of replying him? Why can't all these other companies they get licenses make USEFUL items like these?!??!! because they're too busy making new games for them? i feel part of me died (or at least what left of it). I would LOVE that Metalman! For me, tomahawman, looks so fun! The quality of these are top notch. I really like the Metal Man one. No, the world doesn't need more swag. We're already buried under a pile of the stuff. The worlds needs a damn game already. These are FAN WORKS. They are by no means official or endorsed by Capcom. Yes we could really use an actual game right about now, but that shouldn't be an excuse for limiting fans on how they want to proclaim their love for the series. Seriously, I hate these kind of posts. That MetalMan is just beautiful!!! Do want it! !